xYour favorite churros are scaled down into bite-sized pieces! 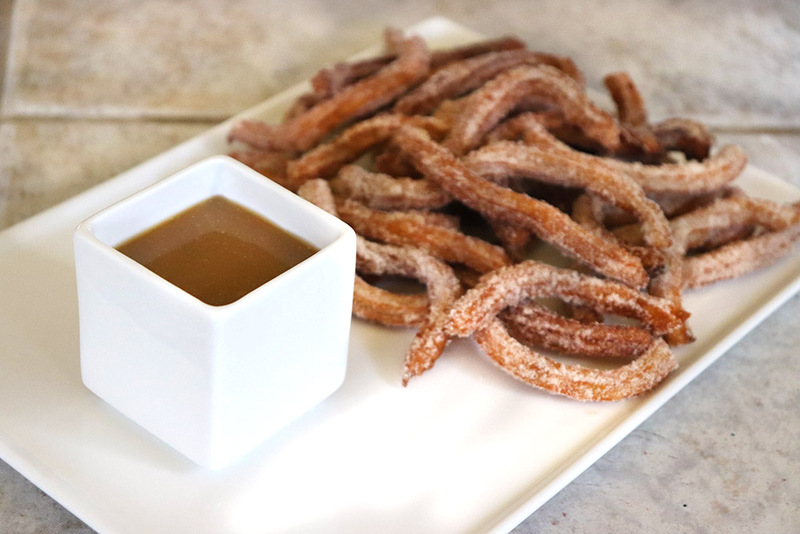 Paired with an irresistible homemade caramel dipping sauce for a perfect snack or dessert! I spent most of my life living in the southeastern part of the state. I was 30-minutes from the Texas border, but still considered myself very “New Mexican”. 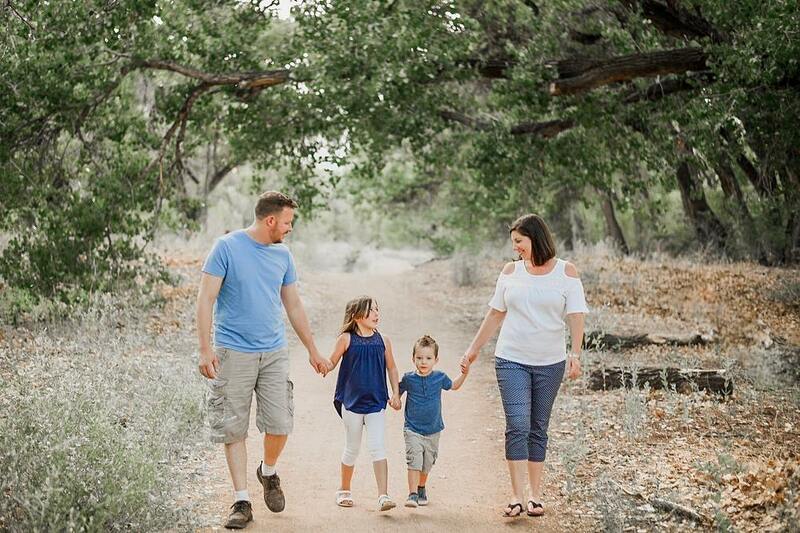 It wasn’t until I moved to Albuquerque that I realized how different the culture is throughout the state! If you’ve ever watched this video, and you’re a New Mexican, you definitely identify with one or the other! For example – when I lived in southeastern part of the state, I always, always had salsa with my breakfast burritos. If you go to a restaurant, they automatically ask if you want salsa. When I first moved to Albuquerque, I went through Blakes to grab a breakfast burrito and was astounded that they didn’t even have salsa. WHAT DO YOU MEAN YOU DON’T HAVE SALSA? YOU’RE A NEW MEXICAN RESTAURANT! I went into work and complained about this “New Mexican” restaurant that didn’t even serve salsa, and was received with a bunch of blank stares. My co-workers who had lived in Albuquerque their whole lives seemed foreign to the concept of salsa with breakfast burritos. They kindly suggested I added red or green chile to my burrito, thus negating the need for salsa. And I learned an important lesson — salsa with burritos is a Tex-Mex thing, not a New Mexican thing. New Mexicans add chile to their burritos, not salsa. If you live on the eastern side of the state, you might be more influenced by Texas than New Mexico. That was a little hard to swallow, TBH. My 7-year-old daughter, who has now been living in Albuquerque for 2 years, is addicted to them though! She has to have the churro sundae from Cliffs every time she goes. In a small bowl, combine flour and 1 tsp cinnamon. In a medium saucepan, combine water, sugar, butter, and salt. Bring to a boil, and immediately add in flour mixture, mixing until incorporated. Transfer dough to a bowl and with a stand or hand mixer, add in eggs, one at a time. Continue mixing until dough is fully combined and smooth. Add dough to tip-lined pastry bag. Combine 1 tbsp cinnamon with 1 cup sugar in a pie dish or wide bowl. Heat oil in a large frying pan over medium heat, until temperature reaches 350. Pipe dough into the oil mixture, using scissors to cut the dough at 4" strips. Fry 4 - 5 churros at a time, making sure not to over-crowd the pan. Fry churros in oil, turning occasionally, until brown on all sides (about 2 - 3 minutes per batch). 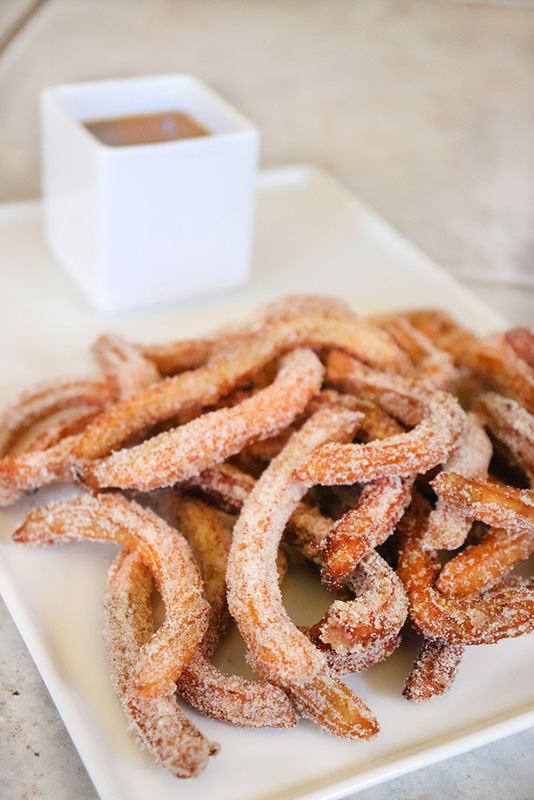 Transfer cooked churros to a paper=towel lined baking sheet, then toss them in the cinnamon sugar mixture until coated. Repeat until all churros are cooked. Add heavy cream and brown sugar to a saucepan over medium heat. Bring to a low boil, stirring frequently until the sugar is dissolved. Simmer while continuing to stir, until mixture is reduced down to 1 cup (about 10 minutes. Stir in condensed milk until fully incorporated. 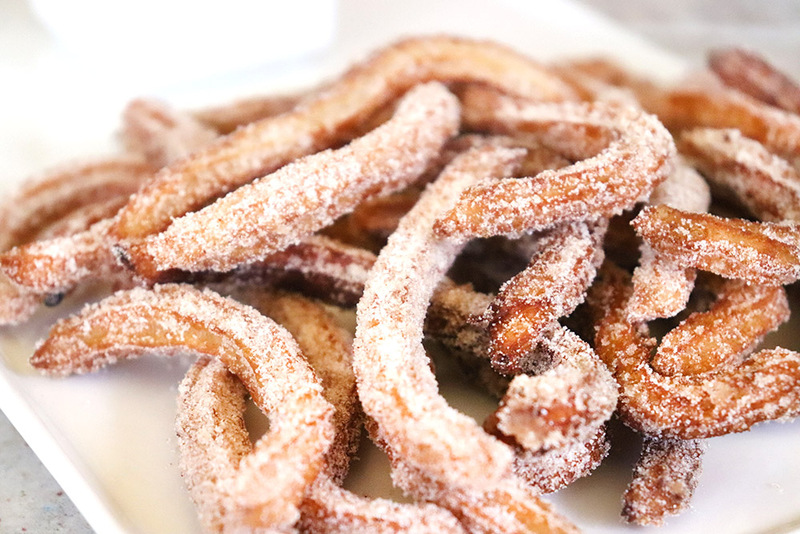 Serve warm with churros. Pin this recipe to your favorite New Mexican dessert board by clicking on the image below! Looking for more New Mexican desserts? Try these!